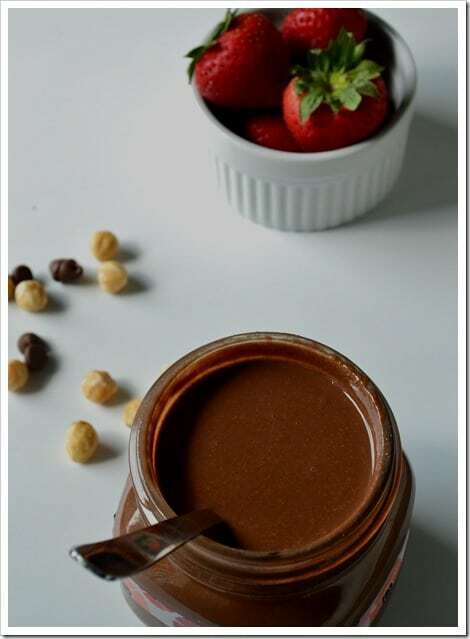 A lot of research went into this recipe of Hazelnut butter spread better known by it’s brand name Nutella because the first time I tried it did not pass the muster (not mine but my daughter’s). The nut butter was too coarse, not very sweet and did not taste like the ‘original’…maybe because it was more hazelnut than chocolate and kids once they are used to the sweet tasting Nutella find it difficult to appreciate the ‘real’ thing. Though I wanted my daughter to give this recipe her seal of approval, I was also adamant about the fact that I didn’t want the primary ingredient of Hazelnut butter to be sugar. Therefore I carefully scoured the internet till I could narrow down to a few recipes that I thought would fit the bill. I started with only hazelnuts and added the rest of the ingredients after several taste tests. So apart from hazelnuts, I used milk chocolate morsels, confectioners sugar (for sweetness and the fact that it dissolves quickly),oil to get the silky texture and cocoa powder to heighten the chocolate flavor in the spread. I (and my munchkin) really liked the resultant spread but would definitely like to lower the quantity of milk chocolate morsels next time so that I can call it the healthy hazelnut spread. Note: The hazelnuts we bought the first time had skin + shell. It was not fun trying to break the shell, get the hazelnuts out and then roast them to get the skin out.I recommend using hazelnuts without the skin (it is such a time saver. Toast the hazelnuts on a baking sheet for about 10-12 minutes till they have browned a bit. Microwave the chocolate morsels along with the oil in a microwave safe bowl for 30 seconds (or more if needed). Stir well until all the morsels have turned into a chocolate sauce like consistency. Grind the hazelnuts in a food processor until it turns into a fine paste (see pictures above). Add the melted chocolate,confectioners sugar and cocoa powder and blend it for a minute or two till all the ingredients are mixed together. The mixture will be runny at this point and will thicken once it cools down. Once cooled, store it in an airtight container and refrigerate it.